Reports of Indo-Pacific lionfish munching on native fish species off the Atlantic Coast come amid renewed calls for restrictions on the importation of nonnative species. A proposed new law would adversely affect importation, breeding and possession of the approximately 10,000 species in the pet trade, including hundreds of aquarium fish and invertebrates. Aquarists should let their representatives know this law will adversely affect our hobby and the trade it supports, without effectively dealing with the problem of invasive species. To be sure, the lionfish problem can likely be traced, sadly, to accidental and/or intentional releases from the aquarium hobby and trade. 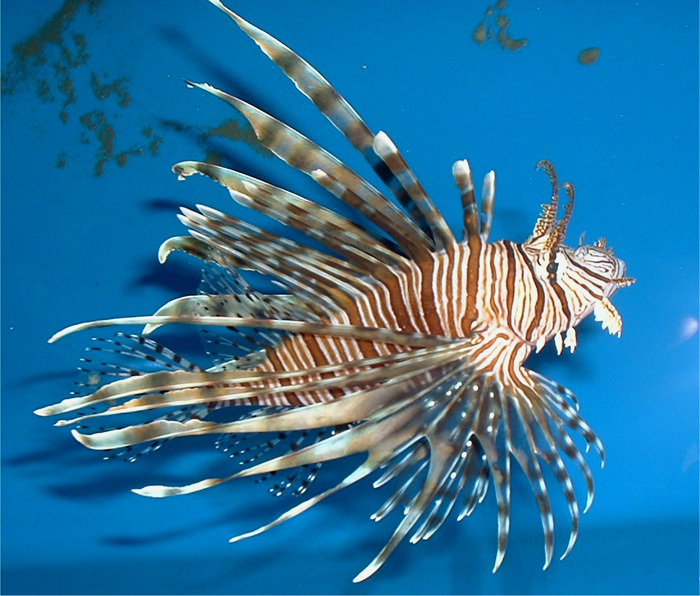 The fish species in question, Pterois volitans and P. miles have little or no commercial value outside the aquarium industry. Thus, the initial invaders were probably brought in for aquarium sales. It is difficult to imagine how they might have become so firmly entrenched so quickly as the result of a random, “ballast water” introduction. Hobbyists or dealers, unable to cope with a fish that reaches well over a foot in length, have, probably with great reluctance, released numerous adult specimens into our offshore waters, no doubt thinking they were humanely disposing of a pet they could no longer care for. Thus, aquarists will probably have to own this particular invasion. We are forced to admit that unintended consequences can sometimes be attributed to our well-intentioned efforts in bringing exotic species from the oceans and rivers of the world into our home aquariums. Nevertheless, the latest attempt by Congress to confront invasive species issues, known as the Nonnative Wildlife Invasion Prevention Act (HR6311), goes too far. It places an unnecessarily onerous burden on the aquarium industry and some others dependent upon animal imports. A key provision of HR6311 directs the U. S. Fish and Wildlife Service (USFWS) to create and publish a list of wildlife species approved for importation. Thereafter, importation of any species not on the list would be prohibited. Possession or cultivation of non-listed species would also be banned, leaving open the question of what to do with individuals of any banned species that might already be here. (11) other factors important to the risks associated with the species. Sounds like a thorough and reasoned approach, does it not? Most definitely not, according to Marshall Meyers, Executive Vice-President and General Counsel of the Pet Industry Joint Advisory Council (PIJAC). Meyers and I have met only once, on opposite sides of the table in discussions about another kind of aquarium industry list. At that time, we had many disagreements, but that is a story for another blog post. Now, we see eye-to-eye on the invasive species issue. Meyers testified before Congress last July 26. Some highlights of his testimony will serve to expose many of the serious flaws to be found in HR6311. In the first place, Meyers correctly points out that much of the bill is redundant. I agree completely that better enforcement of existing regulations would serve to accomplish much of what the bill sets out to do, which is reduce the risk of introducing an invasive species into an American ecosystem. Of course, no list of every species in the animal kingdom exists, even though some efforts are underway to compile one. We don’t know how many species there are, much less which ones might be harmful. If Meyers’ touch of sarcasm here was lost on legislators, it would come as no surprise to me, however. The bill is full of such nonsense. When HR6311 requires that all nonnative organisms proposed for importation to the United States be identified “to the species level, including to the extent possible more specific information on its subspecies and genetic identity” Meyers rightfully asks what should be done about the South American armored catfishes that are imported by the thousands, and which have not yet been described by ichthyologists. For many of these, there is no species name, much less information about genetic identity. One can make a similar argument for the legions of marine invertebrates belonging to undescribed taxa. In terms of the number of affected species, the aquarium industry would surely bear the brunt of this legislation. There are about 1600 species of freshwater fish, alone, in the aquarium trade. What about “the likelihood that pathogenic species, parasitic species, or free-living species may accompany the species proposed for importation” as a consideration? All animal species harbor other organisms, but as Meyers notes, the mere presence of a secondary organism does not imply danger. Some parasites, for example, survive only in or on a particular host, and thus pose no threat to anything else. Even a cursory reading of this document will reveal the extraordinary complexity of the issues involved. Once you’re done reading, you might want to email your representative. All of us have an interest in preventing truly harmful species from entering the country for whatever reason. But requiring proof that a species has zero potential for harm anytime, anyplace before it can be imported is not only ludicrous, but mathematically impossible. Industry stakeholders and hobbyists alike should ask Congress to take a more carefully thought-out approach to this problem. Is Our Hobby In Trouble?